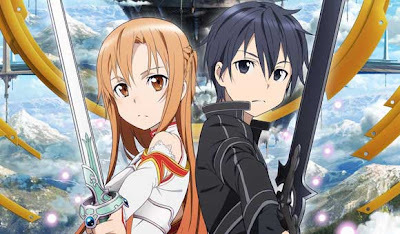 Over the last couple of days I've been checking out some of Sword Art Online, the newest anime to tackle the world of online gaming (yeah, I know there's a manga, but I don't like reading manga). I'm five episodes into the series thus far, and it's been an entertaining romp. It's approach to MMOs, and understanding thereof are a bit on the simplistic side, but I find myself liking the characters quite a lot, and am taken aback by how dark the show can get sometimes. Probably the other super popular anime to center on MMORPGs was .Hack, but I didn't really pay close attention to the series when it was all the rage. I'd poke my head in for a random episode when I remembered it was on, was reasonably entertained, and went merrily on my way, but I didn't go out of my way to follow it. With that, I can't make any comparisons between the two series, as tempting as it would be if I were more familiar with .Hack. 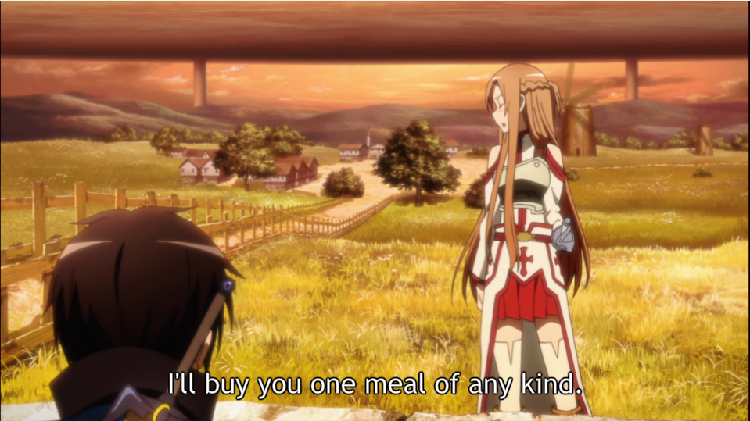 So with that, I'm left to look at Sword Art Online on its own, and see how it goes about approaching the world of MMORPGs, and I do find it fairly simplistic from what I've seen of the series up to this point. There seems to be a big emphasis on grinding out levels for everyone to get stronger, so we see a lot of people going out to fight monsters in order to level up and get stronger, or get money to buy better gear. I guess I find it interesting how the show goes about looking at MMOs because the genre has been in such a state of flux over the last five years or so with some games focusing more on endgame content rather than the leveling process, or it being more about a narrative journey to max level, as opposed to a numbers game, beating up hordes of monsters in search of more and more experience points to get to higher and higher levels. Granted the whole grind is much more of a regional thing with games coming out of Korea and Japan focusing far more on this, which I suspect is why we see such an emphasis on leveling up in the show. It's a central part of many MMORPGs originating from Asia, as opposed to games like World of Warcraft, Eve Online, Lord of the Rings Online, and so on, which all have fairly different goals in comparison. In the story arch that has just begun at the point I'm at now in the series, it looks like the show is touching upon how players try to exploit game mechanics to do stuff that the developers never intended. At least that's the impression I'm getting. It's basically a murder mystery as someone in the game world has found a way to PK (player kill) people in safe zones when they shouldn't be able to. I have a hunch of what may be going on, as I suspect the murderer is inflicting the initial damage on his or her targets, and then letting environmental damage finish the person off. Who knows if I'm right or wrong (well, I guess those of you who have seen more of the series know whether or not I'm correct, but don't spoil it for me! ), but I am curious how this arch will end, not just in terms of solving who the murderer is but also how the person is killing the other players. What has really grabbed me about Sword Art Online is the characters, as they're quite likable. The main character, Kirito, is being presented as a self-imposed loner with the weight of a virtual world on his shoulders. There's a certain loneliness to him because one can see he'd rather make his way through this world with others, but when he's done this players have either been jealous that he knows so much about the game seeing as he was in the beta, or people around him have died, so he's forced himself to solo everything. He's had a few friends invite him to join their group, but to this point he's declined their offers. I do hope that he eventually teams up with other people more, and it doesn't end in sorrow for a change. About the only person he seems reasonably close with is Asuna, but that's more because he seems to like her, and she's obviously being groomed as Kirito's love interest in the show. They do make a good pair, though, not simply because of the romantic undertones, but because they fight well together, and as they work to solve the murder mystery they seem to have good chemistry when trying to accomplish a task. With that, I'm hoping things work out between them. It would also be nice to see a bit more of Klein, as he's a nice guy, and he and Kirito get along well. 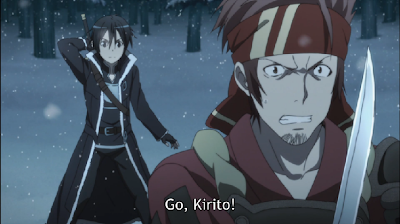 The male bonding may even do Kirito some good. The quality of the animation visuals is actually quite good. 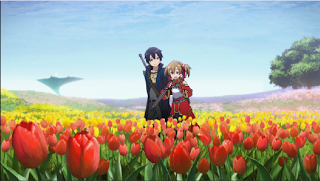 Environments have quite a bit of detail, and the show seems to be trying hard to present the world of Sword Art Online as having many different sorts of levels that the players must venture through. About the only thing I don't like about it is that the show can sometimes overly sexualize some of the female characters. 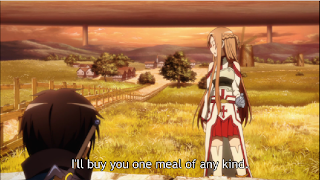 The first instance of this to stand out for me was with Silica when Kirito helped her revive her pet. There was just way too many forced moments of moe-isms that grated on me. I've also noticed a few poses and camera angles with Asuna in them that made me think, "Is that really necessary?" Other than that, though, the visual presentation of the show has been great! After five episodes, I'm quite enjoying this show. It's not taking any immensely novel approaches in how it portrays an MMORPG up to this point, but I'm fine with that because I'm really liking the characters. The series actually goes on into a number of other online games in the manga, and I find myself becoming more and more curious about these places. With that, Sword Art Online may be a series where I actually want to go ahead and read the manga just so I can see what happens next after the anime inevitably ends.